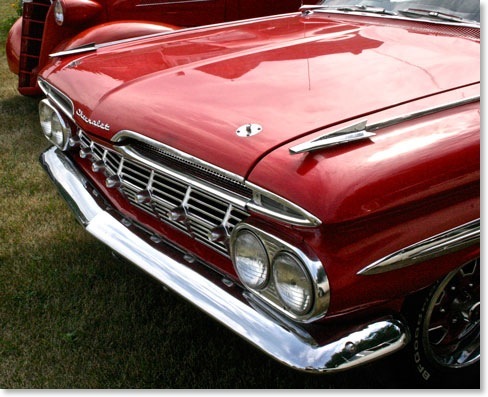 General motors took their 1958 models added a few more inches to the wheel base and a little more width, used the same power train but really made some sheet metal changes. 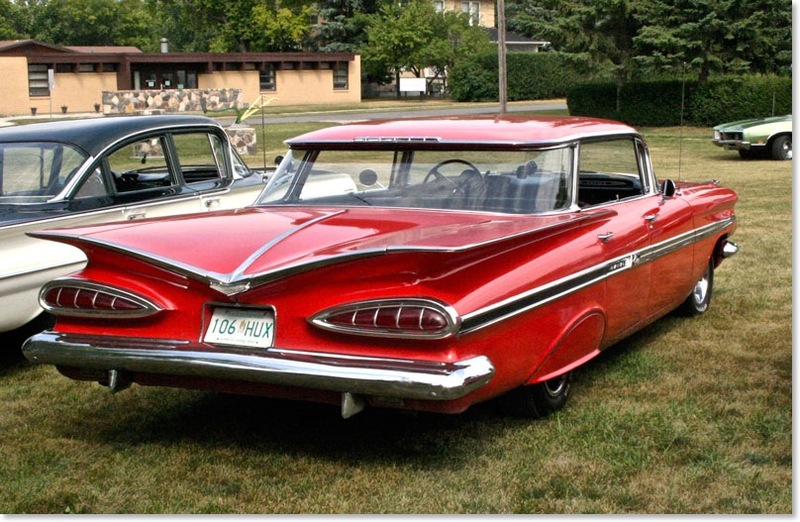 While Chrysler had tail fins like a fighter plane the chevy was given horizontal fins with almost laughable tail lights. 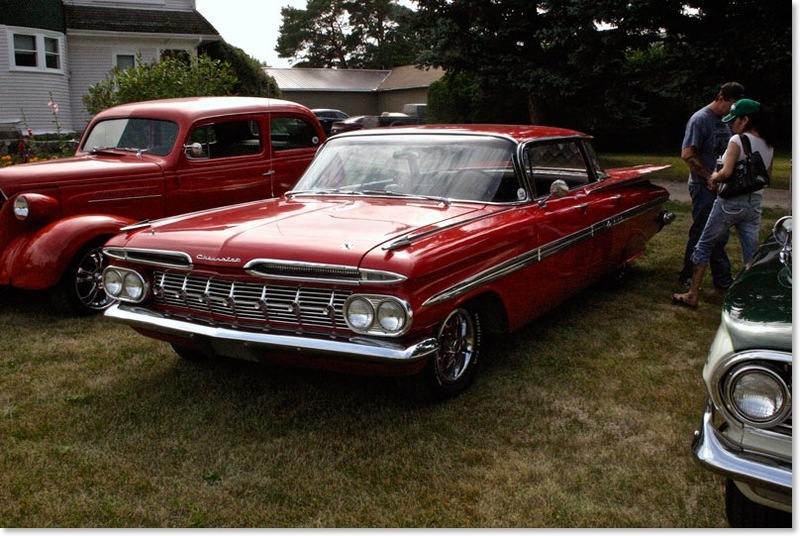 The real styling went into the roof line where the hard top coup was almost a canopy while the four door hardtop was referred to as a flat top. They sold well and though they had grown in weight even the modest 283 V-8 was a pretty zippy car. 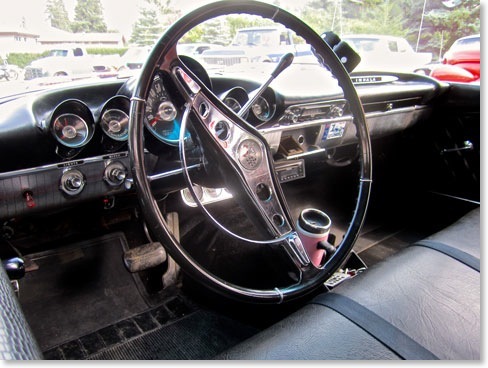 Remember folks this was before seat belts and just look over that dash and consider the amount of injury occurring even with a low speed fender bender. The “X” frame under that body was a bit soft with that the four wheel coil springs made this a rather dangerous car to ride in at any speed. Here in Saskatchewan the highways of the 1950s were sufficiently bad enough to keep the speeds down and reduce the carnage. But in those years most highways were not paved and choking blinding dust slowed traffic but it also created high mortality rates with huge numbers of preventable injuries. Look at the back window on this car. It wrapped right around the back of the passenger compartment. The back window on the two door was just as spectacular as it sloped from above your head in the back seat to somewhere toward that enormous trunk. I remember just how big that trunk lid was and how many people could sit on it.